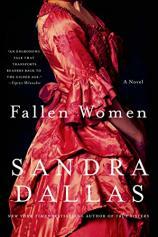 According to her website, FALLEN WOMEN, a mystery set in Denver’s seedy tenderloin district in 1885, took Sandra Dallas 22 years to write. Of course, she has written 11 other novels for adults, 10 volumes of nonfiction, and one young adult novel, most of which were published during that time. But for the New York Times bestselling author known for her sweeping historical fiction set mostly in the West, this particular book --- her first mystery --- was a challenge. The setup for FALLEN WOMEN is a juicy one. Beret Osmundsen, a moneyed philanthropist in New York, receives a telegram from her aunt and uncle (a prominent judge and candidate for the Senate seat) in Denver informing her of her sister Lillie’s sudden death. When Beret inquires into the circumstances surrounding Lillie’s passing and receives only a vague response in return, she decides to make the trip West in order to dig deeper. What she finds when she arrives is beyond anything she might have imagined: Lillie was brutally stabbed eight times and left to drown in her own blood. Worse yet, Lillie was found in Miss Hettie’s House of Dreams, a brothel where she had worked for quite some time. "Dallas certainly puts on a good show to divert your attentions away from the culprit.... To have an idea and to work on it, or some form of it, until it’s just right --- even if it takes 22 years --- is in itself a supreme accomplishment." For the majority of the book, the matter of solving Lillie’s murder coincides with Beret’s attempts to come to terms with who Lillie was as a person. Was Lillie the angelic cherub Beret insists she was, or was she a seducer of men who didn’t care who she hurt or what relationships she trashed in the process of landing the man she intended to bed? Did Lillie have a role in her own untimely death, or was she merely a victim of random violence common in whorehouses at that time? In hopes of tracking down her sister’s murderer, Beret seeks the help of Detective Mick McCauley, an Irish cop with his eye on the job --- and a smile for the ladies. Together, the two turn over every rock to unearth a connection between Lillie and a cold-blooded killer who might have wanted her dead. Was it Jonas, the disfigured 17-year-old stable boy who lived with her aunt, uncle and Lillie before she was turned out, and whose mother was once an abused prostitute? Was it Beret’s slimy ex-husband Teddy, whose affair with Lillie was the reason his marriage with Beret ended? Was it Joey Summers, a high-society suitor of Lillie’s whose love went unrequited for too long? Or was it Evan Summers, Joey’s pompous father, threatened by Lillie’s secret pregnancy that might reveal his debauched ongoing dalliance with Lillie? The truth, dear mystery lovers, isn’t revealed until the end. Depending on how witty and resourceful you are, the identity of the murderer may or may not surprise you. Dallas certainly puts on a good show to divert your attentions away from the culprit. The servants may know (but aren’t telling), clues are dropped (some, obvious; others, false leads), and none of the suspects or witnesses are reliable or even respectable (all could be culpable in my book). It’s mostly just Beret sleuthing out inconsistencies in suspects’ alibis and coming up with a motive --- and proof --- that sticks. It must be said that Beret is not a smart detective. She’s smart, but stupid (you know those types? ), often brazenly putting herself in situations she can’t get out of, like the scene at the opium den when Beret, asking too many questions without backup, is almost drugged, kidnapped, and sold into sexual slavery. Her miraculous escape seems more like a dumb-luck fluke or an outtake from a pulpy potboiler or a Kung-Fu movie than any believable twist of fate. This happens more than once, and with each confrontation, Beret’s credibility as a character weakens. Still, she puts up a good fight until the mystery is solved, evening the score and taking names in the process. All in all, Sandra Dallas’s first attempt at writing a mystery is a valiant effort; the fact that she found it challenging is expected. To have an idea and to work on it, or some form of it, until it’s just right --- even if it takes 22 years --- is in itself a supreme accomplishment.